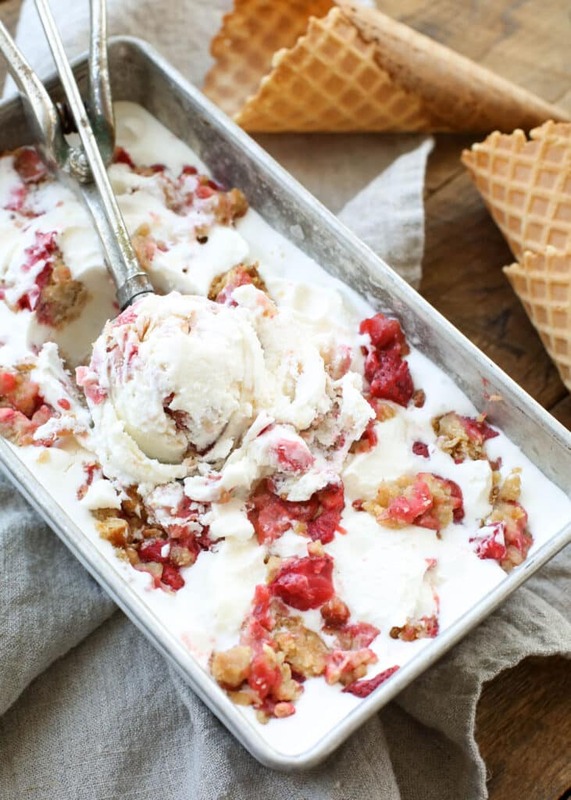 Strawberry Crisp Ice Cream starts with a pan of Strawberry Rhubarb Crunch, or in this case if you’re like me and out of rhubarb, make it a Strawberry Crunch. Fresh berries are tucked in between brown sugar and oat layers and then baked into bubbling golden brown heaven. Go ahead and eat half the crunch while it’s warm the first day (you won’t be able to resist, trust me) and then tuck the rest of the pan into the refrigerator overnight. Before we go much further, let’s clarify the difference between a fruit crisp and a fruit crunch. (Is this technically a thing? Who knows? But in my mind, it needs to be explained.) Two layers of crust make this dessert a fruit “crunch” vs a “crisp”. That said, most of you are still going to call it a fruit crisp and that works well for this ice cream, because the ice cream itself isn’t crunchy at all. So, I’m calling it Strawberry Crisp Ice Cream. How’s that for confusing you bright and early on a Tuesday morning? Remember the Apple Crisp Ice Cream? and the Peach Cobbler Ice Cream that I went a bit crazy over a couple years ago? When I spied the leftover Strawberry Rhubarb Crunch in the refrigerator last week, I decided it was time for a new ice cream flavor. I’ve made this Strawberry Crisp Ice Cream a couple times now (both with and without the rhubarb) and I can’t get enough of it. If you’re hanging out with me on Snapchat or Instagram, you’ve gotten a peek at this ice cream a few times now. The Strawberry Crisp / Crunch is pretty spectacular on its own, but it’s about to get better. 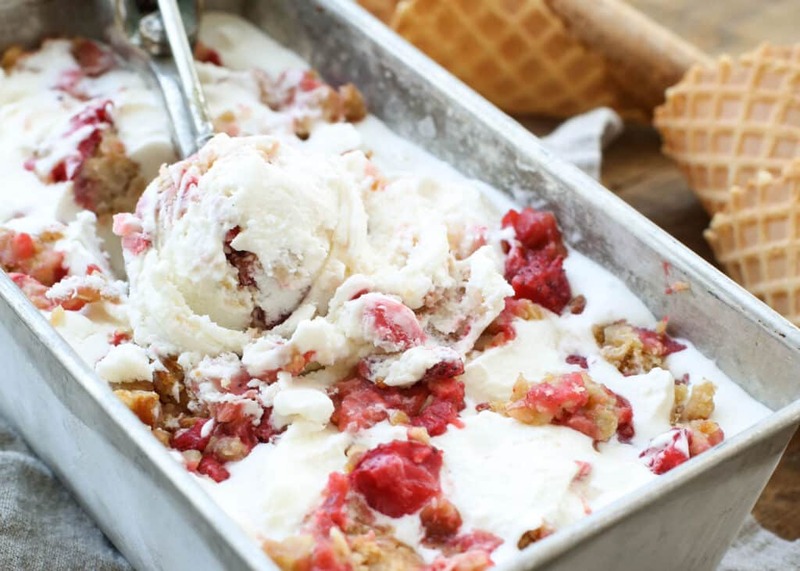 Bite-size chunks of strawberry crisp are swirled into my favorite homemade vanilla ice cream. The ice cream is amazing as soft serve straight out of the machine with the chunks of crisp added to it, but after a few hours in the freezer? Then it really shines with its blend of creamy ice cream, sweet berries, and an abundance of chewy brown sugar oat crust pieces. For more great strawberry desserts, check out this Strawberry Shortcake Cake Roll. I’ve been craving it every since I first saw it. This Strawberry Ice Cream Cone Pie tastes exactly like an ice cream cone and I can’t get enough of it. And these Strawberries and Cream Magic Bars are on my list to try soon as well. Nothing beats a strawberry dessert in the summertime. Kitchen Tip: I use this ice cream maker (and this ice cream maker) and the results are great with both machines. Homemade vanilla ice cream filled with chunks of strawberry crisp is an frozen treat that no one will forget. Whisk together the cream, milk, vanilla, sugar, and salt. Pour into your ice cream maker and freeze according to the manufacturer's directions. While the ice cream is churning, use a large spatula to slice and transfer 1/2 of the cold cobbler to a cutting board. Roughly chop the crisp until all the pieces are bite-size. You'll need about 3 cups worth of bite-size chunks of strawberry crisp. When the ice cream has finished churning, transfer half of it to a large air-tight container. Add 1/2 of the chunks of strawberry crisp and stir gently to distribute. Cover with the remaining ice cream and remaining pieces of strawberry crisp. Stir gently, leaving plenty of chunks peeking through the top. Cover with lid and freeze until firm. Enjoy! 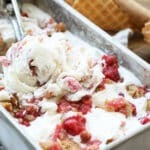 While my first choice for this ice cream is the Strawberry Rhubarb Crunch exactly as written, I don't always have rhubarb on hand when the craving hits. I've made this with all strawberries and no rhubarb as well. If you are skipping the rhubarb, double the strawberries and proceed as the recipe is written. The ice cream (and the crisp) are absolutely delicious both ways. Oh my goodness girl! This is the one I've been waiting for :) What a lovely recipe - and I can't wait to try it - woohoo! Would this work with all blueberries? Thank you! Absolutely! Happy ice cream making! Hello, can you double this recipe, an put it in electric 5 qt, ice cream freezer ? I'm guessing that will work without any issues, however, I have not tried that myself to say for certain. I'd certainly be willing to try it though.